In 1974, God opened Elder Don’s eyes to salvation in Christ Jesus through the Word of God and the prayers of his newly saved wife. Don attended a Bible conference where the Holy Spirit convicted him of his sin. He responded in repentance and received Christ as his Lord and Savior. 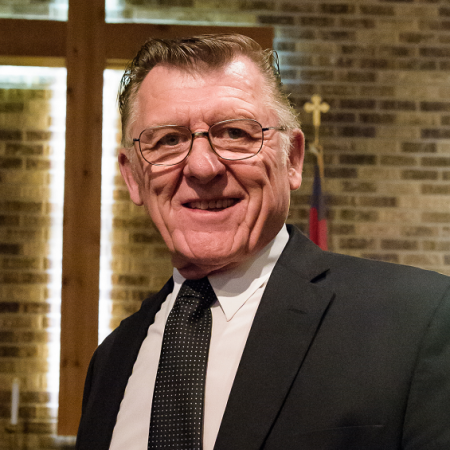 Don served as a deacon for many years at Chisago Lakes Baptist Church, leading in building projects, teaching the College and Career Group, and ministering in nursing homes and serving in the church jail ministry. He became interested in church planting in 2004 when his church planted and supported a new work in Pine City, Minnesota. It was soon after that that Pastor Rich was called back to Minnesota from Chicago to plant Grace Community Bible Church south of the river, and Don was asked to be a part in that work. Don has been serving as an Elder at Grace Community Bible Church since its inception, giving special leadership to the areas of Worship, Children’s Sunday school, and counseling. Don has taken some courses at Central Baptist Theological Seminary and is pursuing counseling education at Faith Biblical Counseling Center in Lafayette, Indiana. He is especially interested in seeing families grow and mature together in Christ, and has a passion for outreach in the South Metro. Don and his wife Naomi have been residents of the northern suburbs of the Twin Cities for the past forty years, but now reside in Lakeville, Minnesota. They have four grown children, two son-in-laws, one daughter-in-law, and fifteen grandchildren, with news of number sixteen. In addition to serving in the church, Don also enjoys hunting and fishing, especially with his wife and grandkids. Don is especially thankful to the Lord for His graciousness in protecting and guiding his life up until his point of conversion and for God’s faithfulness to lead him and his family in following the ways of the Lord ever since. He and his wife are grateful to have such wonderful opportunities to serve Jesus by serving in their local church body.